I decide to add a page for women (and their friends) as we get so many enquiries from women. Most enquiries to date have been related to finding good martial art and kickboxing clubs to train with. There are thousands of martial art clubs in the UK now, but not all seem to welcome women. So how do you find the right one for you? Finding a selection of local clubs, offering a selection of martial arts, will be probably be easy (unless you live somewhere remote) - the tricky thing is picking the right one for you. Not all styles of martial art / types of club / instructors will be right for you. some may not treat you (or anyone else for that matter) with respect / appropriate care / appropriate attitude. Are you mainly interested in self-defence? Do you want to try something new and meet new people? Are you looking for a weekly activity? or a way of life? Do you want to enter competitions and/or test for higher ranks in a system? Do you have other reasons for trying out martial arts? When you know why you want to do it, you'll be in a better position to decide which art(s) to try. There are literally thousands of different styles of martial art available, and they can be sub-divided in many ways, e.g. Will respect you, encourage you and guide you towards your goal. If you want an idea of how a woman will get on in a particular martial arts club or style, see what proportion of students are female, and how long they have been training. Do women stay? Do they progress? Are they happy with their classes? How do they get on with the instructors? Are there any female instructors? Some people use the terms martial art and self-defence interchangeably. BUT, they are not the same thing. 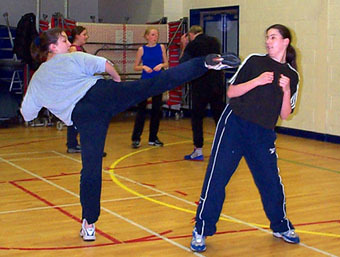 In self-defence, you may use some physical skills that you have learnt in the martial arts or other situations (fighting with brothers, sisters or friends, playground or street fighting, close-quarter combat or military training), however, the emphasis of self-defence should be using awareness and forward-planning to avoid risky situations. Good self-defence instructors will also cover training in assertive communication, body language, and personal space, as well as legal issues. Some martial arts have Governing Bodies in this country, some of these are recognised by the Sports Council, some are not. Just because an art/or martial art club is not recognised by the Sports Council does not mean it is bad - it simply may not have enough members yet for recognition. Just because an art/or martial art club is recognized by the Sports Council does not mean it is good for you or your purposes - you have to use your common sense and trust your instincts. Just because a group chooses to call itself the 'whatever Governing Body', doesn't guarantee that it actually is a recognised governing body, you'd have to check that with the Sports Council! (Some groups have really impressive names, like 'world council' or 'global federation', but there's really nobody who can verify that kind of claim).